When Harry Rosenberg first walked into the legendary Savoy Ballroom in 1936 and looked around the dance floor at the great dancers, he was not intimidated. “I’m gonna be the best dancer in the Savoy Ballroom,” he told himself. Then his eyes fell on Frankie Manning. As Harry told the story, Frankie had not even swung out, he and his partner were just jockeying in place. But Harry saw something and quickly revised his prediction: “I’m gonna be the best white dancer in the Savoy Ballroom,” he decided. Ruthie Rheingold Ettin first entered the Savoy Ballroom in 1934 when she was 16. It was a fluke — her brother and his friend had been shown up by their dates, so they took her and her girlfriend instead. She recalls, “Although I was a little shy, the music took the shyness away.” She became a regular at the Savoy. Whitey was always on the lookout for talented dancers, and their race was not an issue to him. Over the years there were a few white Lindy Hoppers in Whitey’s elite group. When Whitey approached Harry to join the group, he already had a partner picked out for him, a extraordinary white dancer that Harry had never met. In fact, Whitey had never met her either, but he was very good at spotting talent and matching partners. This time was no exception. 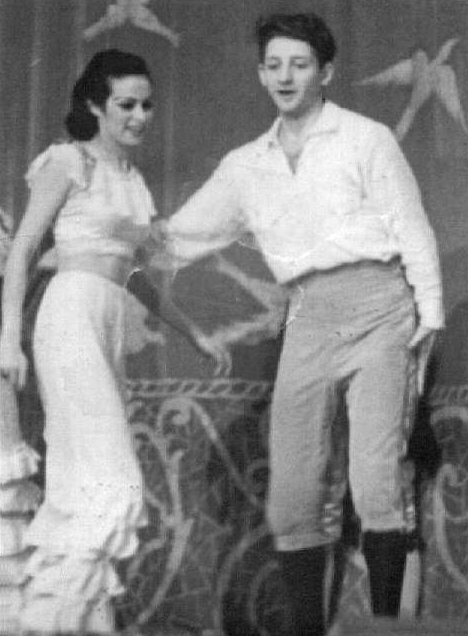 They approached Ruthie Rheingold and surprised her with an invitation to become one of Whitey’s Lindy Hoppers as Harry’s partner. Unfortunately, the rest of the country and the rest of the world were not as comfortable with racial mixing as the crowd at the Savoy Ballroom, so we do not get to see Harry and Ruthie dancing in any of the Whitey’s Lindy Hoppers film clips in this archive. Ruthie remembers that when the press came to take photographs or newsfilms, she and Harry were always shooed out of the picture. “Why was that?” she asks today. Frankie Manning says that the censorship was imposed by the press and did not come from Whitey or the management of the Savoy Ballroom. Harry was a tough guy from the Bronx, who had spent two years in an orphanage when his family was too poor to hold together. Ruthie was an energetic and delightful young lady who was crazy about swing music and dancing at the Savoy. Sometimes Harry was difficult and temperamental as a dance partner, but the two of them danced sensationally together. They were never romantically involved; it was the dancing was important to them. Ruthie recalls two professional engagements from their days in Whitey’s Lindy Hoppers: a week at the Apollo, where Harry and Ruthie danced to the Duke Ellington Orchestra and another week there dancing to Fletcher Henderson. Ruthie’s dancing combined grace with a wonderful sense of rhythm and musicality. She recalls that the Duke himself was impressed with her dancing and wondered out loud why someone so talented, and white, would be a Lindy Hopper when she could aspire to being a star on Broadway or in Hollywood film– options not available to the talented black youngsters. But Ruthie says she never thought about those things; she was too busy having a blast dancing to great swing music.